Its been awhile since my last transcription post, but that’s not to say I haven’t been busy…my most recent project has just been a beast. For those who follow Chris Potter, you may be aware that he offers lessons through his site. They come in pre-recorded bundles of interviews, exercises (not nearly enough of these…grrrr…) and tour-de-force performances of specific standards. The infamous “All the Things You Are” performance he gave has been floating around for years and a few decent transcriptions are out there as well. Potter recorded “Confirmation” for one of these lessons a few years back. “Confirmation” was a tune I cut my teeth on. I used to warm up with the head and a few choruses of solo for years, even playing it on my NEC audition. But as familiar as I am with the tune, it still poses several challenges. Playing sensible melodies while still hinting the chords tends to lead me down the same cliches over and over. This solo-sax recording has presented a great opportunity to hear a master take the tune in a huge number of different directions. 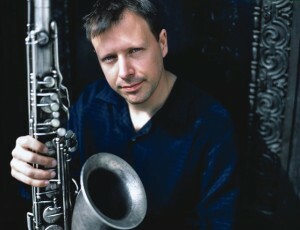 From the interviews, Chris Potter describes the performance as starting “really down the middle Bebop”, playing clean lines perfectly in sync with the chords. Then he says he’ll “kind of work my way out”. In this case, “out” involves everything from intervallic ideas, absurdly extended hemiolas, planing in minor and major 3rds and even a few chorus of “26-2” changes thrown in for good measure. Chorus 1: straight ahead…lots of tritone subs but mostly just really clean bop. Chorus 2: More clean bop. There’s a hip extension of one of Parker’s cliches in bar 71, and he hints at “26-2” over the bridge. Chorus 3: Starting a bit early in bar 94, Potter “works his way out” by developing an idea from 4ths and enclosures. The bridge takes a stylistic turn into a hemiola (implied 3/4 in this case) that goes on more-or-less until bar 132 without dropping a beat! Chorus 5: The fun continues…he’s really extending the chords, but there are enough hints of the underlying progression to hold it together. Bar 181 to 184 has one of my favorite licks in the whole solo. Chorus 7: More hemiola but masked inside of this cool intervallic idea. The bridge is one of the cleanest melodies in the whole solo. Chorus 8: “26-2”, Coltrane’s contrafact over “Confirmation”, provides the changes. Potter plays this chorus clean, sounding the changes really clearly. Chorus 9: Continuing “26-2”, he stretches out rhythmically, culminating in a really intricate triplets phrase right before the bridge. The last section focuses on a juicy “digital” sequence built from 5, 1, 3 and #11 starting in bar 312. The Out Head: A pretty clean rendition of the head at first, but he loosens up on the bridge, developing a few of the simpler ideas. The final section is played very soloistically but has enough shades of the original to still be called the head. Well, there you go. A really detailed solo by Potter and hundreds of new ideas for approaching Bop changes from a modern master. Enjoy! is there any chance you could upload the audio file as well? Glad you guys like the transcription! As far as posting the song, it comes with a lessons package on Chris’s site…I don’t feel comfortable posting it. I don’t want to take away from what he’s done with those (which I happen to think are really cool). So instead, let me just recommend you go check out the lesson on his site.